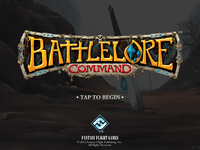 BattleLore: Command provides an engaging and challenging combat experience, both for expert players of the board game and for players who are entirely new to BattleLore. Its missions will test and develop the tactical skills of any commander, whether leading the Daqan Lords in the defense of their homeland or ravaging Terrinoth with the Uthuk Y’llan. Prepare to command an army in battle against its greatest foe.